Then Annas bound Jesus and sent him to Caiaphas, the high priest. Meanwhile, as Simon Peter was standing by the fire warming himself, they asked him again, "You're not one of his disciples, are you?" He denied it, saying, "No, I am not." A disciple? Yes, a disciple is one who follows a master in order to be like that teacher. Clearly, Peter hasn't gotten the concept yet. He might be willing to be like Jesus in his power, performing miracles and amazing the people. However, this "cross thing" that holds Jesus' attention is not understandable to Peter. So he fails, again. 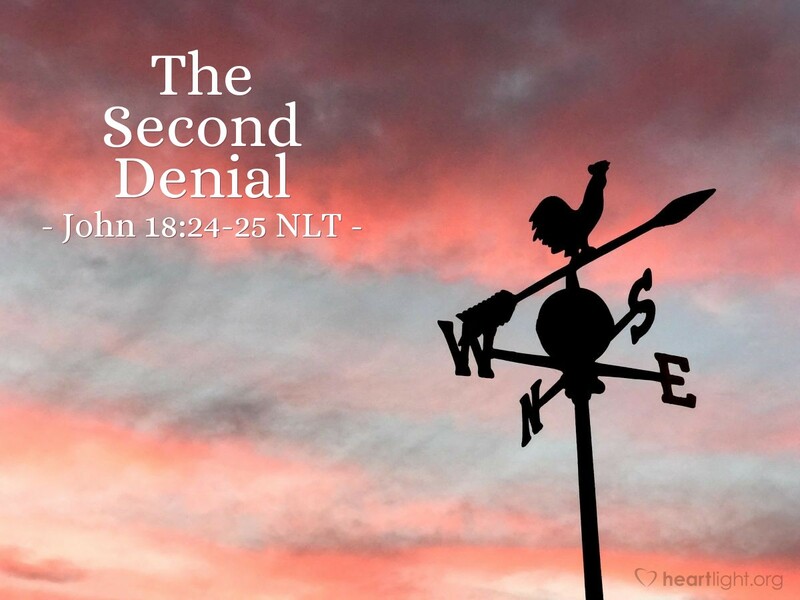 Not just once, but now a second time, he denies his Lord — the very Lord he should be seeking to emulate. History will later show that Peter did become like his Master. Aren't we glad that Jesus didn't give up on Peter when he failed ... even though he did so repeatedly! Aren't we glad that Jesus doesn't give up on us either! Dear Heavenly Father, forgive me for my failure and my sin. I do not like my sinfulness, and I want to be more than I am. Please fashion me into a vessel fit for useful and faithful service to you and to your kingdom. I truly believe that you can make me more than I am. I trust, dear Lord, that you can use my failure and my sin to grow me into a more holy and useful person for you. In Jesus' name, and because of his saving grace, I pray. Amen.